Denture Processing - Lab Depot ltd. The time of each step can be set between 0 and 999 minutes. The end temperatures at each plateau can be regulated by the user between 32ºF and 210ºF (0ºC and 99ºC). the machine against electric overloads. An 8 Quart Pneumatic Curing Vessel-Pressure Pot. Made of sturdy cast aluminum The new 448PP pressure vessel is built to provide 20 psi pressure* – while the acrylic resin is curing – forming a dense crosslinked repair for the dentist and patient. The 448PP will not only allow for proper denture repair and relines, but will also double as a substitute curing pot-accommodating a 2-case bronze compress with the cover removed. 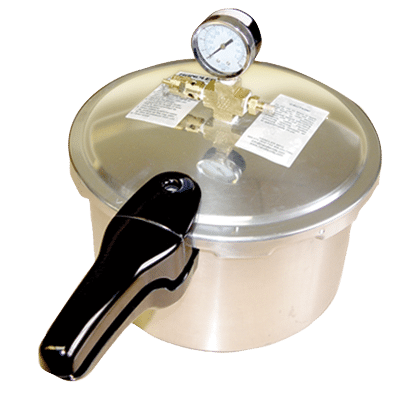 The 448PP is shipped complete with pressure gauge, safety valve, air valve to introduce air into the pot, plus an air hose ready to connect to your compressor air source. 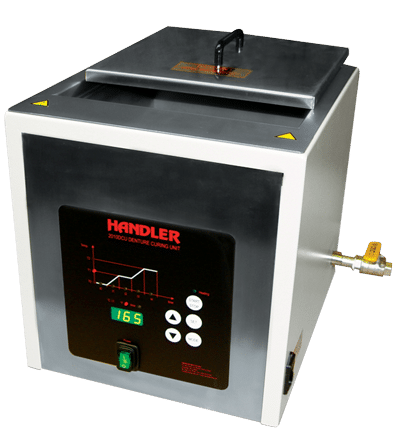 Handler introduces a New Boilout/Washout/Curing Unit complete with powder coated cabinet. Built & designed by Handler THE NEW 26105SSWC will provide your prosthetics laboratory with years of service at almost 40% savings over competitive units. Vented cabinet with internal shield, Available with economical gas or electrical powered, Heavy duty recirculating pump, Four faucet washout-tank-turn on walk away de-wax dentures, partials and flasks. Additional faucet (P26105-30F) available to fill tanks. 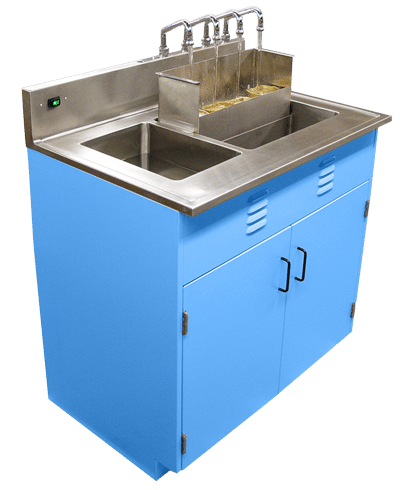 Curing unit holds 8 two flask compresses-16 flasks, Heavy gauge stainless steel for durability & functionality, Sinks built into stainless steel top with seamless design, Marine Edging keeps water from running off work surface, built by Handler in the U.S.A.
Electric – 26105SSWCEL – Specify 208V, 220V or 240V. Gas – 26105WCG – Specify natural gas or manufactured gas. built to your specifications, CALL HANDLER OR YOUR DISTRIBUTOR FOR DETAILS.